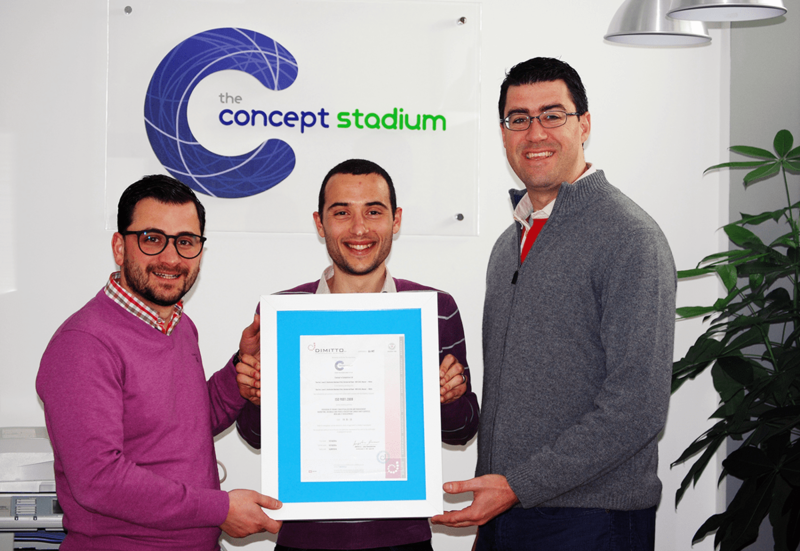 The Concept Stadium became an ISO-certified boutique marketing consultancy firm in Malta, after being awarded the ISO 9001:2008 certification for the provision of brand conceptualisation and management; marketing, business and public perception consultancy services; web development; and IT development. The certification was achieved after a thorough 8-month audit in 2016, which included the streamlining of all its operations, from client acquisition and acceptance, project briefs, idea generation, conceptualisation, design, execution and billing and other administrative processed. Jonathan Dalli and Jonathan Chetcuti, the Concept Stadium Founders and Directors, explained that “The ISO certification was a target we set for ourselves from the beginning of the year. It was a strategic decision we took at a management level, which was also supported by each member of our team. After all, our operations are carried through all our six main services areas and improving our performance meant that they are all in-line with the ISO ethos”. But the ISO certification is not a one-time-gig for the Concept Stadium. “The ISO 9001 standard comes with a mandatory yearly audit which helps us remain in check”, they said. “This process allows us to manifest our commitment to efficiency, which ultimately benefits the most important stakeholder in our ‘stadium’, the client. As as a team of commercial creative servicing clients in a boutique environment; we have always reiterated that we are not interested in media commissions, but rather use a billing system that is time-and efficiency based. We believe that this delivers the message that we are here for the long-term. We want to deliver value and be a solid marketing partner for our clients, not merely acting as another agency in the market”, they added. ISO 9001 is an internationally-recognised certificate of quality standard with a set of voluntary guidelines that assures the client that a firm delivers consistently every time and with every interaction.